Spike and Puppy All dressed up!!! 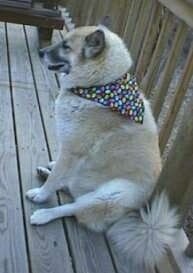 Spike and Puppy received their new scarves in the mail today. As you can see they are pretty happy! 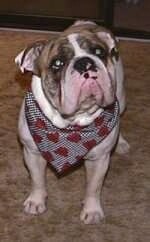 Check out my snazzy Bulldog scarf!! I have to admit, red is my color. Mom, are you going to give me that bone or what?? 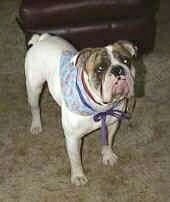 I want to thank Phyllis Mahaney for the wonderful scarves she made for my dogs. Phyllis is starting her own business called Pammer's Petwear. She offers very reasonably priced, handmade scarves and snoods (for those dogs whose ears hang in their food).